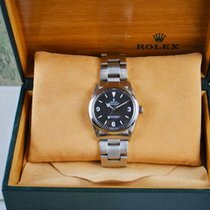 Rolex Corona per Explorer 1016 e 1655 "Freccione"
For sale is a beautiful Rolex explorer reference 1016 from 1971. The watch is in overall good condition with a great case that looks to be unpolished. Beautiful matte clean frog foot dial with nice creamy patina on hands and markers. The watch is keeping good time and winding properly. The bracelet is in good condition with little stretch and fits over 7in wrist. The dial is black just the lighting makes it look a little grey.